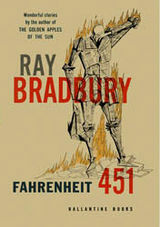 Ray Bradbury’s Fahrenheit 451 is certainly one of the most read and most debated books in our canon. Because of its straightforward plot and writing, it is a popular requirement in high schools. While I was not required to read it, like many high school students I had my “Bradbury” phase and read many of his works. But like many books, the central idea becomes detached from the novel as memories fade and is used in all types of ways that Bradbury likely never intended. It is a book on censorship. It is book on government control. It is a book about the power of books. All of that is true. What does happen when thoughts are censored and governments control what we know and do not know. What would happen in a world without books, where those ideas can no longer be debated. But really, this is a book about us. The readers. The should-be-readers. The once-upon-a-time readers. Because this is really a book not about books, but what we take from them. The books hold no value. And the people who memorize books hold no value in and of themselves. Both books and people are simply vessels in such cases. It is the ideas that are essential. And Bradbury is bemoaning a society, although set in the future, which is already at hand. How do the ideas in the books change us? When did we start to allow others to think for us? As the scholar and drifter, Granger, says at the end of the novel, “even when we had the books on hand, a long time ago, we didn’t use what we got out of them. We went right on insulting the dead.” What good are all the ideas if we simply read and do not act on them, do not allow them to challenge us, to penetrate us, to alter us. It is ironic, and Bradbury no doubt lived to see this, that his own work would likewise be distorted and misunderstood. It is not about books. It is about ideas and people and their need to interact. For those not familiar with the book, or like me have about 30 years since the last reading, a quick summary. Montag is a fireman in the not so distant future, but not a fireman we would not know. He does not put out fires, he creates them. In a world of fireproof buildings his job is to burn books (which burn at Fahrenheit 451) in a world where books are not allowed. He is 30 years old, good at this job, and should be happy in life. Of course, he is not. His wife has tried to commit suicide, a common problem at the time, and there is really no strong emotional tie to her. Most relationships at that time are bereft of emotions, which instead get channeled into interactive tv-like walls which can serve as your world. These walls appear often and hint at an early and well-placed concern about how television (and expand that out today to any number of electronics) robs people of substantive thought, making them passive bystanders in a world of their own creation. Montag meets a teenage girl who simply questions his life and thus sends him reeling. It turns out he has hidden some books away, and finally watching an older woman burn herself with her books pushes him over the edge. He seeks the hidden mysteries of the book, which brings him into conflict with his fire captain, a suspiciously well-read man for someone who burns books. To say more would be to give away too much of the ending, and this is a plot driven story which features a climatic ending. What is interesting, in today’s electronic world (and I read this on my Kindle), is how clearly implausible such a plot would be today. But the book does not suffer from age since the vehicles for reading are not as important as the ideas behind the books. Bradbury’s exploration of a life well lived in a web of relationships is not held back back by a nearly 60-year-old imagining of the future. As such, it is worth a return visit if you have not read it in many years. Or a first visit if this is all new. But do Bradbury a favor. Do not value the book. Value what you take away from it. This entry was posted in Classics, Novel by derekemerson. Bookmark the permalink.